Relive all the best bits from Children in Need as Ade Adepitan presents highlights from the appeal night, including a sneak peak at the Doctor Who Christmas special. Browse content similar to The Best Bits. Check below for episodes and series from the same categories and more! People of the UK, get your years on. Everyone has been doing it. is really not my colour. real friendships have been formed. important things a child can have. His name's Charlie, and he's nine. and sometimes a bit annoying. This is left, and that's right. And he's great at football. me which way to walk. the way to the ball. because of Children In Need. at Happy Hands in Liverpool. and Lucy come here every week. I didn't know how to speak English. to play with my friends. I have a friend called Sophie. she's from the Butterfly Trust. to help other children like us. at... Or you can text. ask the bill payer for permission. # My heart is hoping. # You'll walk right in tonight. has got to be making Tracy Island. to say yes to virtually everything. it would be something fantastic. life-size model of a businessman. Genuinely the best job in the world. absolutely, a bit like Strictly. to hide on this one. than any of that stuff. in a sort of dancer's mentality. the mirror and realise I'm not. you how to make one. weeks to put that jive together. you Kickety-Kick King of Jive. the same for you, Tim. to come up onto this. you are on Strictly dancing for us. very difficult competition to call. part of all three shows. A huge well done to you. in a rugby match for his local team. that he wasn't able to walk. "I don't know who to turn to." more like I fit in. of the things that they've achieved. in New Zealand, I did a sky dive. of it now, all right? donating to children in the. this year, they didn't disappoint. # Who will buy my sweet red roses? # Who will tie it up with ribbon? # And put it in a box for me. # I'm so high I swear I could fly! # Pull out the stopper! # But get me to the church on time. # Let's have a whopper! # Get him to the church. way I close my eyes. # And he has found me. But every day I'm learning. # Over the rooftops step in time. # Kick your knees up, step in time! # Step in time, step in time. # Never need a reason. # Another day, another destiny. # This neverending road to Calvary. # Will we ever meet again? # In heaven has in store. more day, one day more! She was just so, so poorly then. Children in Need. That number again. lovely to meet you, Tess. excited to meet you, as well. knew, John, you didn't tell anyone. we've literally pushed the boat out. at her work, in a dinghy on wheels. Dressed as a hammerhead shark. had a really good laugh, haven't we? Have we? I still can't feel my feet. Well, we're still working it out. you take it out of the bucket. Share, it is of course Peter Kay. the script up and improvising. of a surprise for everybody. exactly what you're about to do. once again and see you in 2018. We are here! Mark and Amy! It is going to catch on. It's a ten from me. Doing an actual scene for Poldark. 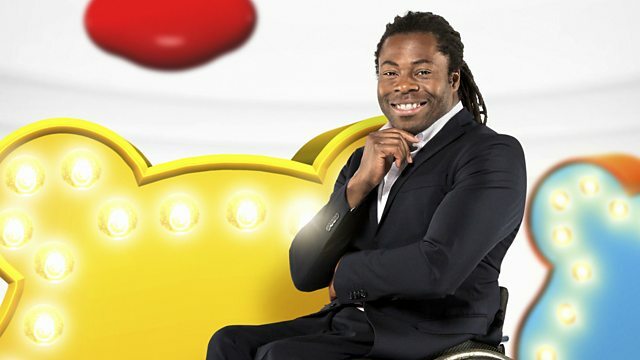 Relive all the best bits from Children in Need 2017 as Ade Adepitan presents highlights from the appeal night. Including a musical extravaganza from the cast of EastEnders, Blue Peter presenters past and present battling it out on the Strictly dance floor, a sneak peak at the Christmas special from Doctor Who and music from Rita Ora and the cast of Annie, plus a whole lot more.